Happy Monday and Cyber Monday! 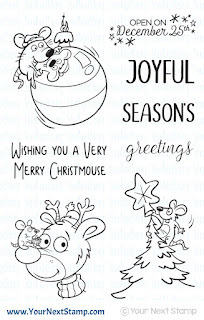 I am Day 6 of the YNS 12 Days of Christmas Series and today I am sharing with you a project that you can create for the holidays using some cute stamps from Your Next Stamp. I am using Holiday Buddies to create a "family photo" of sorts. These cuties were easy to make into a photo op and you can even take a step further by decorating the outside of the frame. That was what I was going to do, but realized I did not have any fun holiday dies small enough to decorate without covering the images. So, I left it as it and decorated the inside with a few gumdrops and star sequins. I used my MISTI to stamp the images at once on each of the Stitched Rectangles before coloring them in with Copics. I measured out the patterned paper, which is an 8.5"x11" piece, to create 9 separate windows. I used strips of black cardstock to glue over the paper before placing my images where I wanted them. I sponged a little distress ink around the edges to take out some of the brightness from the white cardstock before adhering the images down. If making a frame is too much to create, you can always create small canvas art using your images like you can find HERE from a previous post I did on how to use your stamps on canvas. This makes for a cute little pictures around the house. I hope you enjoyed this photo op project and don't forget to continue checking back on the YNS Blog everyday to see what each DT member created for this series. Thanks for popping in and hope you have a great week!! This technique is one that Jennifer McGuire recently posted about using your dies to create a makeshift letterpress. You can find Jennifer's video here. 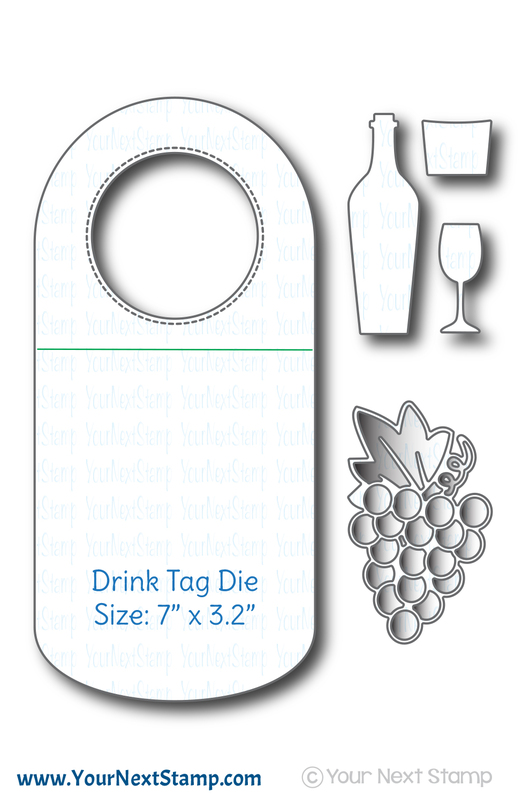 Using the Scribble Tree die and the Drink Tag die, I made this "letterpressed" wine bib which I feel came out pretty great. This technique works like a charm. I heat embossed the sentiment at the top from the Merry Everything set before adding a few sequins to it for added sparkle. A simple tag but one you can make multiple times for easy gift giving. I really enjoyed this technique and I am sure I will be doing this often. I love the look of letterpress so it's great to have a technique to mimic the look. While you are over at the YNS Blog, check out the store because Karen has a fabulous sale going on. 30% OFF everything on the site!! 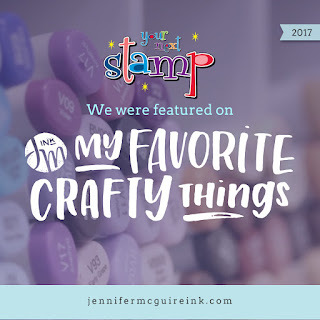 YNS was recently featured on Jennifer McGuire's 2017 favorite crafty things so this is a great time to pick up what she loved at a great price! Thanks for popping in and hope you have a great weekend and find some great deals! It's sneaky peek time with The Cat's Pajamas Stamps for November! So much fun in this release you will not be able to refrain from buying it all. 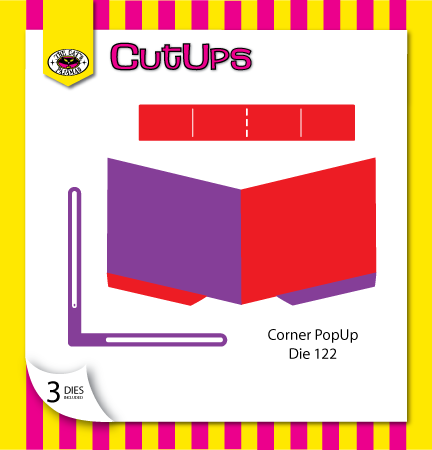 :) The new corner pop up die is amazing with so many possibilities. But you will want to check in on Tuesday when we have the blog hop to see what I and other cats have done with it. For my first sneak, I am using the new stamp set called Sent with Love. Perfect for all occasions. 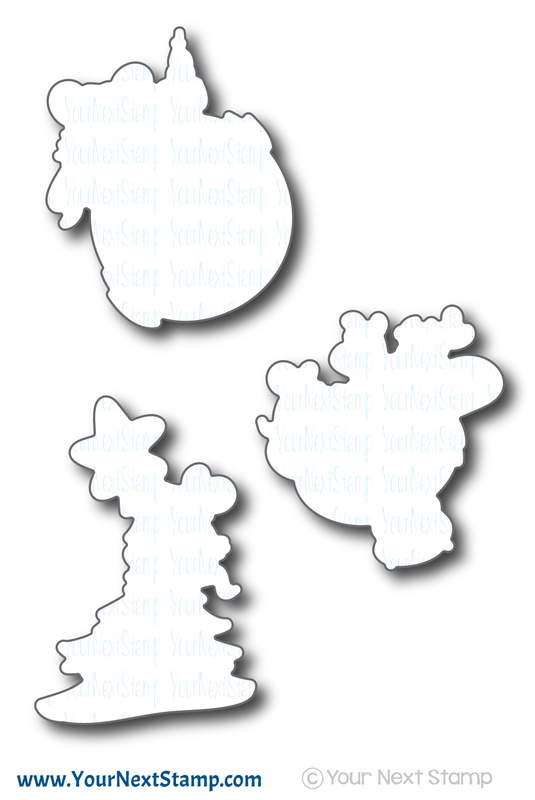 I love all the whimsy bits in this set! For this card, I cut the back panel with one of my diagonal cut edges dies before cutting the patterned paper with the TCP Ornate Frame cut up. The image was heat embossed with the sentiment on top stamped with some black ink and pink ink for the hearts. I used my white gel pen to highlight the birdcage before stamping the letter and fussy cutting it out to be popped up. The patterned paper panel was also popped up and the card was finished with some gold star sequins. My other card is using the new Blessed and Wings Cut-Ups to create this CAS embossed card. These two just seem to be perfect to be shown hand in hand. The top panel is dry embossed using one of my embossing folders while the wings were cut out with some silver glitter cardstock. The word was cut out using some black cardstock and I connected the wings to both sides of the word before popping it up over the embossed panel. The card was finished using some rhinestones for some sparkle. It is that time of the month for the YNS DT dare challenge. This month, we have been challenged to share our favorite Christmas color combos. There are so many fun Christmas combos these days to make for some fun and whimsical gift giving. But for me, I always result in being drawn to Red, White, and Silver. Even my tree is made up of those colors. 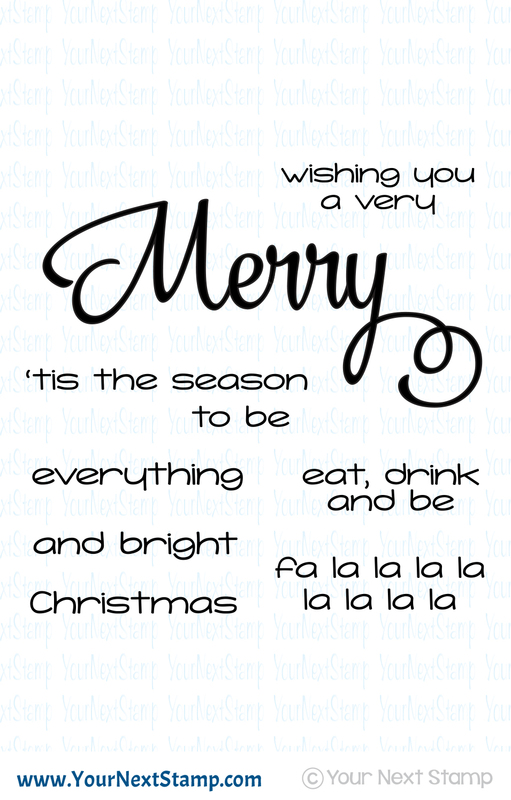 So, in my tree decorating fashion, I have created a card using the newly released Scribble Tree Die set. For this card, I started with a red card layered with some white cardstock. The top red layer is cut out using the Stitched Rectangle die set. The tree and sentiment were cut out using some silver glitter paper but not before layering it on top of three white cardstock layers for some height. I completed the card with a few rhinestone for additional sparkle. This card can be quick and easy for making in quantity. It can take less time f you don't layer the cuts, but just use foam tape. Don't forget to stop by the YNS Blog to see all the awesome color combos the team is sharing. Leave a little love while you are there and you can have a chance at winning a stamp set of your choice!! Woot! Thanks for popping in and have a great day! It's time for some early holiday shopping! That's right, it is time to purchase all the YNS items you have placed on your wish list whilst checking out the DT peeks this morning! :) I know you are not disappointed with what you have seen for this release. For my first card, I created a little scene using the new set called Merry Mouse Joyful Greetings. Using some mirror cardstock, I made the ornament look shiny and for the mouse to see his "reflection." Using some tree dies, I created the background along with some paper from the Holiday Joy paper collection before hanging the mouse from the top. For my second card, I am using the super fun set of Reinbeer. I just love this one since I don't really have any beer type stamps. Many wine, but no beer. 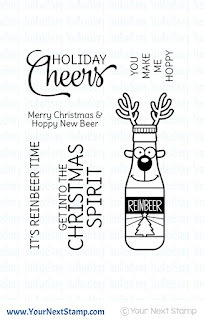 This is a perfect set for a masculine Christmas card or for the beer lover in your life. :) Again, for the background, I am using some paper from the Holiday Joy collection and the center panel is cut using the Stitched Rectangle die set. The beers are popped up and the sentiment heat embossed to lie across the bottom. As always, Karen has a fantastic sale for you to enjoy so that your favorite picks don't hurt your pocketbook too much! 20% OFF YOUR PURCHASE!! 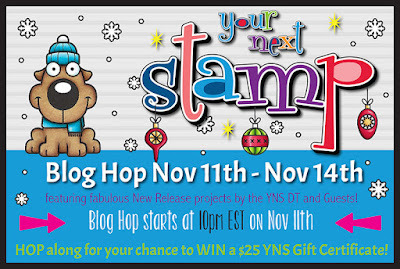 Be sure to keep hopping along and leaving a little love for your chance to win a fabulous YNS Store gift certificate! Thanks for stopping by! Yahoo! 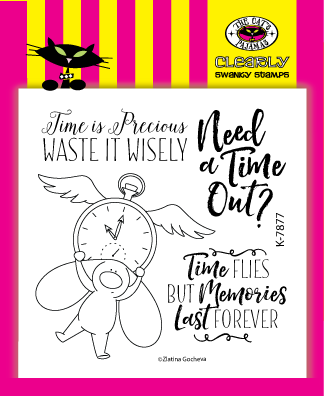 It is time for the November release sneak peek of Your Next Stamp and this release is Wowzer!! 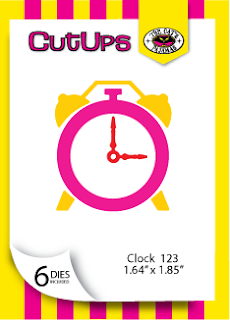 So many awesome holiday sets and dies to end this years' holiday with a bang. 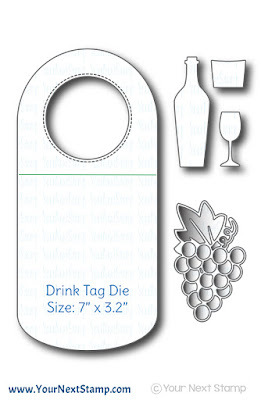 For my sneak, I am showcasing the new Wine Tag Die set and the new Merry Everything. I started with a plain white cardstock base for the tag and layered it with some glitter paper to make this shine!! I couldn't help but use last months release of the Pine Tree Branch die to tie this all in and add a fun bow from the Bow-tiful Little Bows die set. Once I had all my elements cut out, I heat embossed where I wanted the start of my sentiment before adhering all the pieces together. 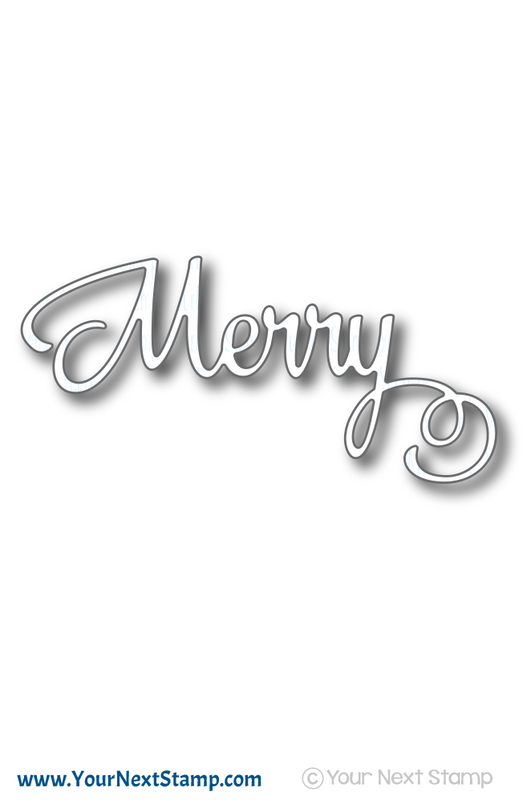 The word 'Merry' was cut out with the new Merry die that coordinates with this Merry Everything stamp set. I do love how this turned out with all the sparkle of the tag and see myself making a few tags this season. 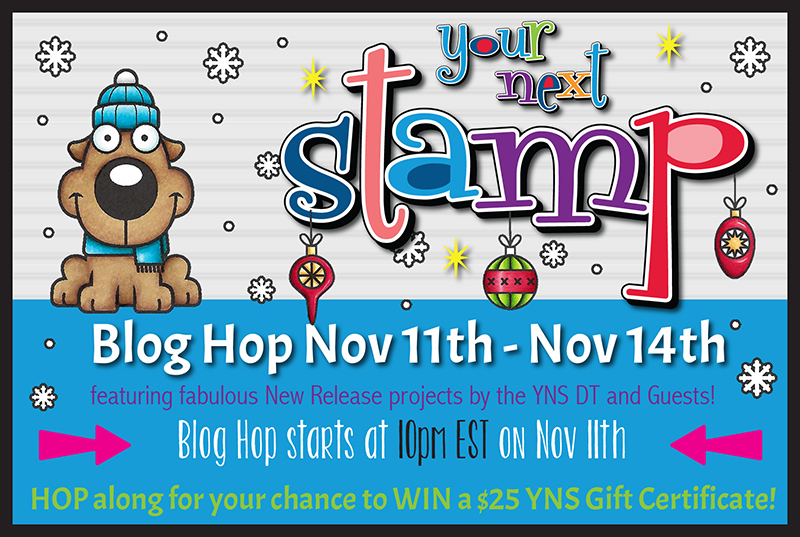 Be sure to stop by the YNS Blog to see all the fun Sneak Peeks from the DT and stop back tonight for the new release blog hop! Thanks for stopping by and we will see you tonight! Happy Veterans Day and Happy Friday! It's another Friday challenge over on the YNS Blog and once again, the sketch will not disappoint. Either direction you decide to make your card, this sketch is perfect for that. For my card, I used the position as the sketch, but my take was a little different in where I placed that bottom strip. I used the super fun and goofy set of Jingle All The Way for the main image. This set is so much fun if you haven't seen it. It's just plain fun! For the circle panel, I used the YNS Stitched Circle Frame before stamping the image to be colored in with Copics and cut out using the coordinated die set. 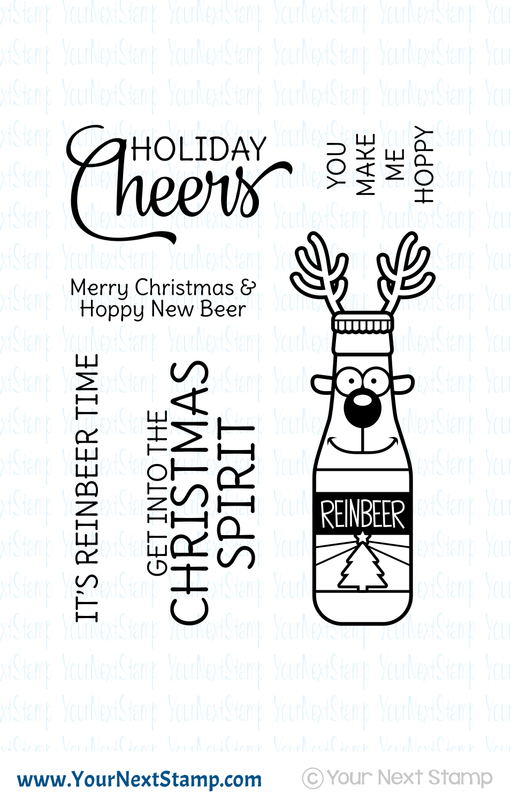 Some of the fun Holiday Joy paper collection was used for the side panel and I heat embossed the sentiment to be popped up on the left with some Platinum colored embossing powder. The rest of the sentiment was stamped at the bottom using some Momento Cottage Ivy green ink. I finished the card with some sequins to be placed around. 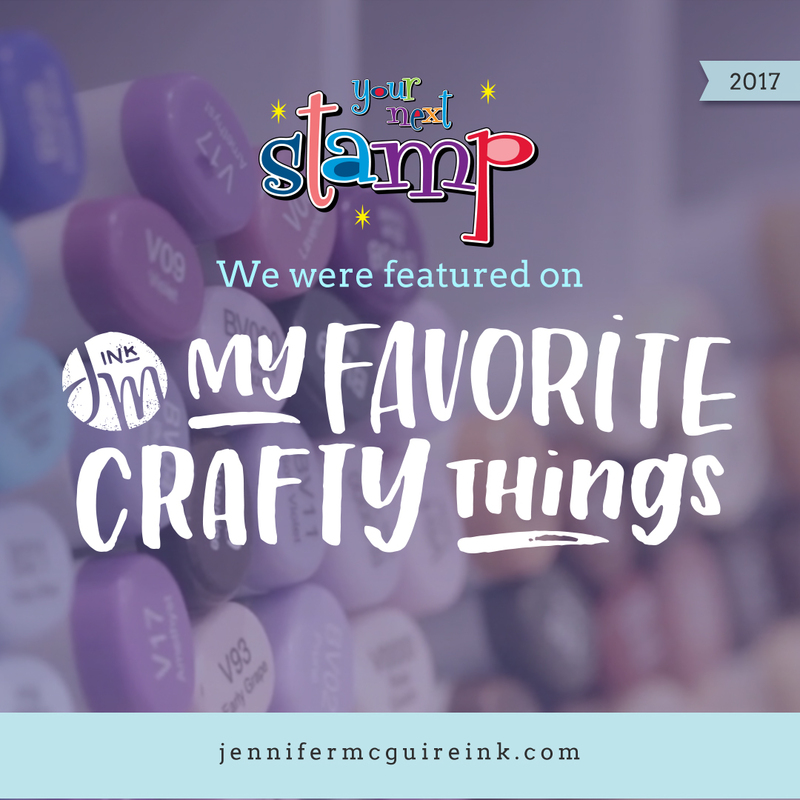 Be sure to stop by the YNS Blog to see the other fun creations some of the DT members have done and sure hope you play along! Link up your creation on the blog for your chance to win a YNS gift certificate! Thanks for stopping by and please, if you see a veteran today, thank them for their service to our country. It will be greatly appreciated by them. 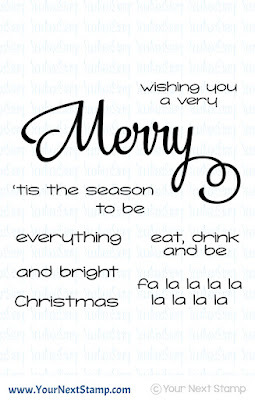 Have a wonderful holiday weekend!